For 23 years Mark Ruffalo has been a journeyman actor, always becoming the character he is called on to play as in his last 3 films. 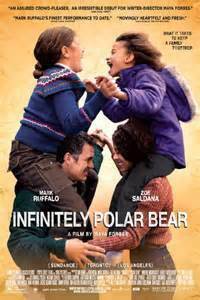 He was Dave Schultz the wrestling Olympic champ in “Foxcatcher”, Ned Weeks, AIDS activist, in “The Normal Heart”, and in today’s movie “Infinitely Polar Bear” is Cam, husband and father who is bipolar. Though probably not a “STAR” or “A” list actor as defined in Hollywood he has had 55 nominations for acting roles in movies, on television and the stage. Lucky for us he can star in ‘large’ movies that allow him to star in ‘small’ movies. In “Infinitely Polar Bear”, a name his youngest daughter gives to her father who was diagnosed as manic-depressive order in the late 1960s which will become bipolar disorder years later, Cam is handed the responsibility of raising his two daughters, Amelia (Imogene Wolodarsky) and Faith (Ashley Aufderheide) for 18 months in Boston while his wife Maggie (Zoe Saldana) goes to New York to earn her MBA at Columbia in New York while the born to a rich for generations family he is poor. The film opens with Cam having a mental breakdown and unable to hold down a job and though his family believed in a first rate education he was kicked out of Harvard and other schools. His background is explained somewhat but it doesn’t go into detail as to why his grandmother would pay his rent for an apartment and, offer him her Bently when his car is really in bad shape, yet won’t offer to send her grandchildren to private school. Though based on a true story written by the director-writer Maya Forbes about her family she seems to have handled her father’s illness with humor whether he was experiencing bipolar episodes or going out on a drinking binge. The fact that her mother is an African-American and father white of an elite Boston family---remember this is in the 1960s--is referred to very briefly in a scene between Maggie and her daughter Amelia, who looks Caucasian as her father and Faith looks Black, telling the former she is Black having a Black mother. Sadly Saldana’s role is underwritten and we learn nothing about her family, or how she learned to deal with her husband’s illness but not why she stopped any sexual relations with him and seems reluctant to resume them. Instead of looking into a man’s mind who is bipolar or a family who is biracial, and the problems both situations may have caused, we are given a warm, funny, feel good family movie where it might have been the way the director-writer dealt with the problems. Mark Ruffalo IS Cam presenting a bipolar man who is a hoarder, a curser, an alcoholic who clearly loves his wife and daughters and takes care of the latter, not always in the best ways, but doesn’t hold back his love. Zoe Saldana is excellent even if her role is underwritten. Imogene Wolodarsky, as the older daughter, represents a teenager embarrassed by her father, which most teenage girls are, but even with dealing his bipolar loves him more. Ashley Aufderheide, the director’s daughter, is a little preconscious and loud but neither daughter changes in any way over an 18 month period. The main reason to see this movie is for another memorable portrait by Mark Ruffalo.